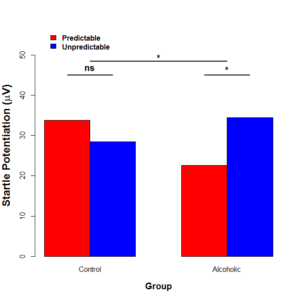 Increased startle potentiation to unpredictable stressors in alcohol dependence: Possible stress neuroadaptation in humans. Stress plays a key role in the development and maintenance of addiction but our understanding of specific mechanisms for these relationships remain limited. Basic neuroscience research suggest that repeated alcohol use changes the brain circuits involved in behavioral and emotional response to stressors. However, this research has been largely conducted in rodent models of addiction and it has been difficult to translate this knowledge to understand how these same stress circuits are affected by chronic drinking in humans. This study aimed to provide preliminary evidence of changes in these same brain stress circuits in human alcoholics. Participants in the current study were either alcoholics who were in early recovery (1-8 weeks without drinking) or people without a history of problems with alcohol (non-alcoholic controls). Participants completed a laboratory stress task designed to assess response driven by the same brain systems that have been found to be altered by heavy alcohol use in rodents. These brain stress systems appear to be particularly sensitive to stressful events that are unpredictable in nature. During the task the startle response was measured as a physiological marker of participants’ defensive response during unpredictable or predictable stressors. Alcohol dependent participants displayed significantly greater startle response to unpredictable than predictable stressors relative to non-alcoholic controls. This provides preliminary support for the hypothesis that chronic alcohol use leads to increased stress-reactivity among alcoholics, particularly to stressful events that are characterized by unpredictability. This study also found that the amount of elevated reactivity to unpredictable stressors in alcoholics was related to their amount of reported alcohol-related problems and their experience of the withdrawal syndrome. Future research may use longitudinal designs to identify whether this exaggerated stress reactivity represents a risk-factor for addiction, a consequence of addiction, or both. Nonetheless, these findings provide interesting avenues for future studies. Pharmacotherapy and psychological interventions may target responses to unpredictable stressors to reduce stress-related relapse in alcoholism and other addictions.